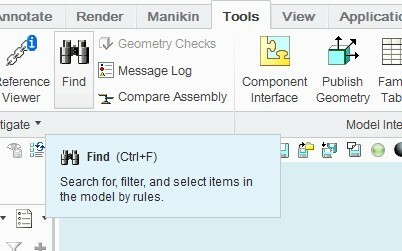 Does anyone have any ideas on how to workaround Creo not having a "Inverse Selection"? Or any other selection workarounds/tricks? Video Link : 4563 IT's my way. Filters... if you know how to use them. I think you can even inverse filters using a .not. argument. I -rarely- use filters because the UI drives me nuts. You do have the Pro/Workaround® extention loaded, right? i started using filters in drawings, that worked out really well. One area of Creo that I'm pretty impressed with is the Find tool. What is lacking is, or maybe it's possible, a quick way to select some components in an assy in the window and isolate them. 2 - RMB->Set Representation To->Master. It only works if the simplified rep is unchanged, but is the fastest way I know. ahh, now i see what you meant by the find tool. there were two workarounds in that video, the inverse select and getting the name of a component to copy/paste. That was another I've been wondering about! If you often use find tool,there are different options/combination. you can get so many joys by find tool.